San Fran to LA in 30 minutes. That's the grand plan that Tesla CEO Elon Musk unveiled Monday. Serial entrepreneur and billionaire Elon Musk unveiled design plans for his Hyperloop -- a superfast transport system that could cut the travel time from Los Angeles to San Francisco to 30 minutes, and cost a fraction of the currently proposed high speed rail project. Musk, a co-founder of PayPal and the man behind commercial space transport firm Space-X and electric car maker Tesla (TSLA), said up to 1,000 employees from both Tesla and Space X worked to come up with the idea, which is basically an elevated tube that moves travel pods at nearly the speed of sound. In a technical paper published Monday, Musk said his idea is similar to the "old pneumatic tubes used to send mail and packages within and between buildings," but would operate under much less pressure to save on energy. The cars would be pushed or pulled through the tube by a series of electric motors, possibly similar to the ones used by the Tesla Model S. Each car would be mounted with a fan in front to move the air out of the way. The air itself would then be directed underneath the car, forming a cushion on which it would ride. 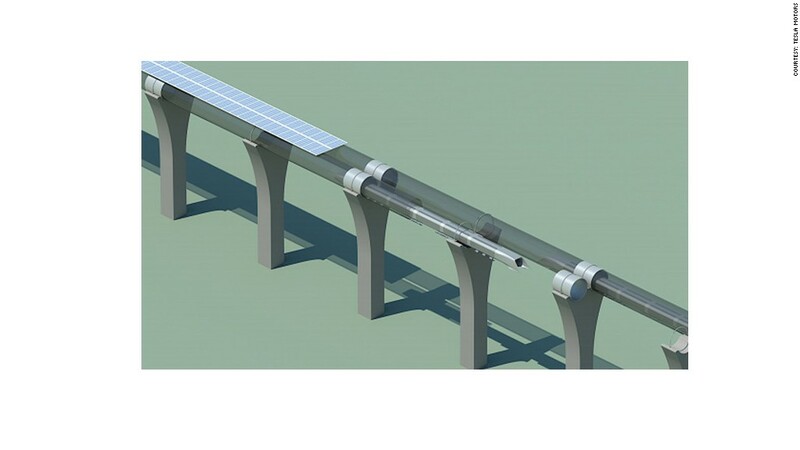 The entire thing would be powered by solar panels mounted on top of the tube. Related: Elon Musk's greatest hits. The tube itself could be built above ground, roughly following California's Interstate 5 highway from Los Angeles to San Francisco. Musk said it could cost less than one-tenth of the planed high speed rail system in California -- a project that's estimated to cost $70 billion. It would also be six times faster. In fact, it was the high cost of the California train that prompted Musk to research the Hyperloop in the first place. "How could it be that the home of Silicon Valley and JPL -- doing incredible things like indexing all the world's knowledge and putting rovers on Mars -- would build a bullet train that is both one of the most expensive per mile and one of the slowest in the world," he wrote. Experts say Musk's idea is technically feasible, but will be hard to implement primarily due to the cost of developing a demonstration project and the time it will take to get all the permits. "He ought to be encouraged, even though proving the technology will be arduous," said Rod Diridon Sr., executive director of the Mineta Transport Institute, a government-funded research outfit. Musk has been talking about the idea for months. He provided few details up until Monday, other than to say he won't take an active role in the project's development and will publish the plans as open source. But on Monday he said he'd be willing to build the demonstration project himself, if no one else steps up to do it. While it's not a top priority for him, he said the prototype could be completed in 3 or 4 years. Earlier, he indicated his idea was similar to one being developed by ET3, a Colorado-based company dedicated to "space travel on earth." ET3's plan is much more ambitious, and involves using a series of vacuum-sealed tubes to whisk magnetically levitated transport cars around the world. A video about the idea claims that in the frictionless environment, the cars, each carrying six people, could top 4,000 miles per hour -- six times the speed of a Boeing 757. It claimed a travel time of 45 minutes from New York to Los Angeles. But Musk said that, among other challenges, maintaining a vacuum in such a large system with so many entry and exit points would be next to impossible.